Infotech City township spreads across 600 acres of beautifully landscaped gardens, creating a serene ambience you can own. The township comprises of 5 different housing complexes, which includes luxurious high-rise apartments, group housing societies, elegant row houses, independent homes and apartment houses. 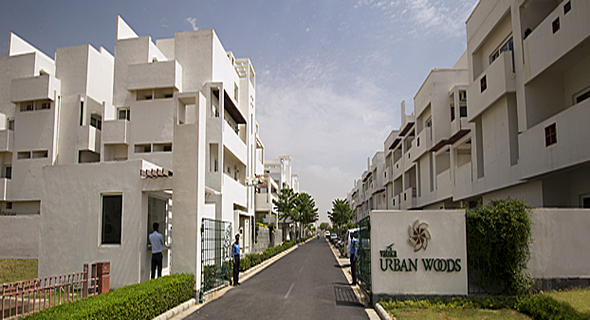 Urban Woods – An immaculately planned and beautifully designed township in Jaipur. Urban Woods is an immaculately planned row-housing development spread across 17 acres near the Central Park of Vatika Infotech City. Urban Woods is a spaciously built and secured residential community, and is one of the 5 residential complexes available in the Infotech City township. Designed by an Indian architect, Ashok Dhawan, Urban Woods has been conceived as a low-rise residential development. The building comprises of contemporary and minimalist straight-line architecture, symbolizing perfect harmony between aesthetics and utility. Urban Woods emphasises contemporary living in a synchronised, well-planned community. The housing complex features 432 three-and four-bedroom independent floors built in a plot area of 300 sq.mtrs, with each apartment size ranging between 1900 sq. ft. to 2600 sq. ft. Each apartment unit has 3 floors. The apartment on the ground floor has a private garden, while the first and second floor apartments have private terraces. Second floor apartment is actually a 4-bedroom duplex, extending on to the third floor. A unique feature of Urban Wood is that each of the 7 streets, along which the apartments are built, are named after the trees (Grevillea, Jacaranda, Bauhinia, Kadamba etc.) that are planted alongside the roads. The exclusive Urban Woods’ Club offers a space for the residents to socialize and celebrate. Apart from regularly organized social functions in its lawn, the Urban Woods’ Club has a lot offer, like a Fully-equipped Gym, Pool Table, Party Hall, Departmental Store, Cafeteria, Card Room and Coffee Lounge, which keeps you wanting for more. With 200 families already living in this oasis of calm, apartments in Urban Woods are ready to move-in. This entry was posted in Township Jaipur and tagged apartments in jaiour, residence in jaipur, residential properties, residential township, township in Jaipur on November 1, 2013 by Admin.